After many years of learning about contrasts in linear models I am curious about the relative usefulness of deviation coding, as it is defined by this website. I would appreciate someone filling me in on a few things. Here is a data simulation exercise to highlight the source of my confusion. 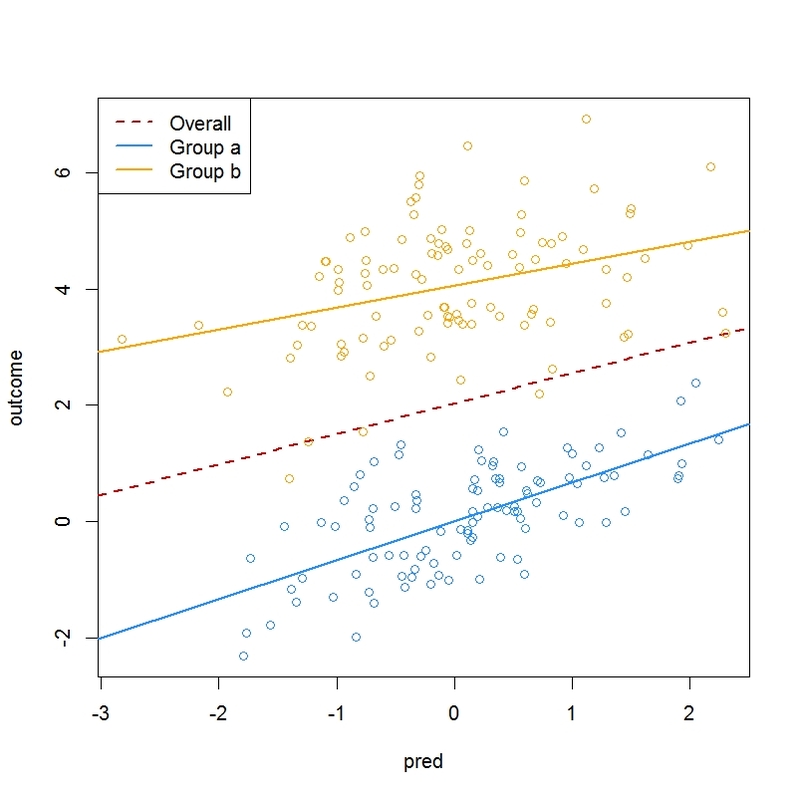 I want to simulate data where there is one two-level categorical predictor (group) and one continuous predictor (pred). I have programmed in between-group differences in the relationship of both predictors to the outcome variable (outcome). Good. Correlations of r = .666 in group a and r = .3 in group b. Very close to the correlations we programmed into the two datasets before we bound them. What about the means of the outcomes? The group coefficient is also correct, a mean difference of four, and the pred:group1 coefficient once again is the difference in slope between groups: -2.88. Like treatment coding, simple coding gives us accurate information. Its incremental benefit over treatment coding is that it yields something like a 'main effect' contrast, the pred coefficient, which is the amount that the pred predictor predicts the outcome, averaged across groups. So is the group coefficient simply half of the real difference between groups, half of the coefficient obtained by the simple coding scheme, i.e. incorrect? Or is it the difference between the group b mean outcome and the grand mean? And what is the pred:group1 coefficient, if not mistaken? And how does any of this relate to type-1 and type-3 sums of squares? The deviation coding is what we get if we specify options(contrasts = c("contr.sum", "contr.poly)), which is supposed to be type-3 (a la SPSS default coding). But it doesn't retrieve the correct parameters, unless I am mistaken and interpreting the regression output incorrectly. @llewmills: This week, I encountered a project where the deviation coding you inquired about came in handy, so I thought I would share here what I learned on this topic. 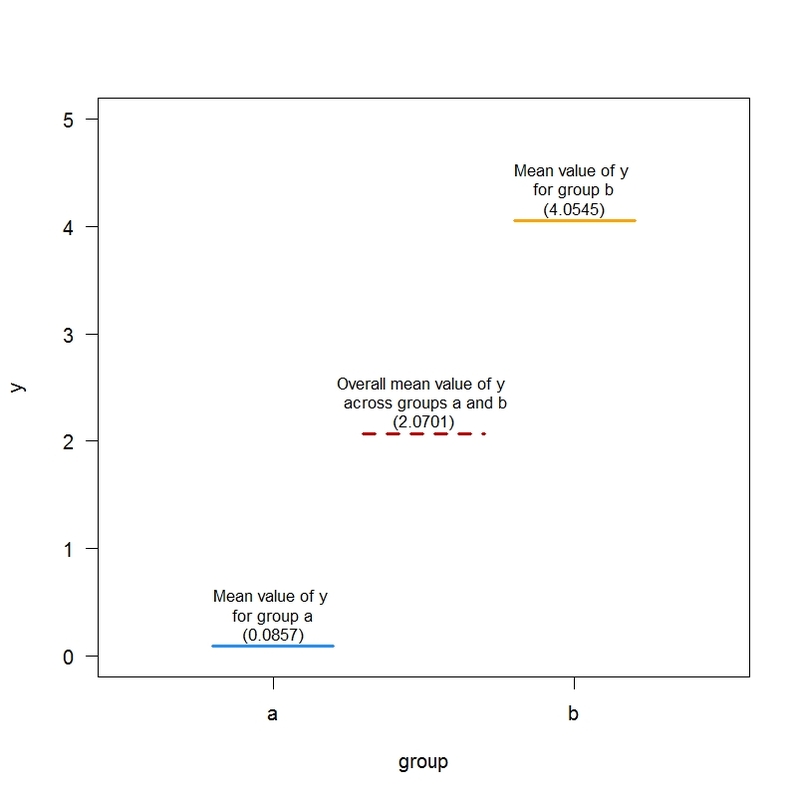 In this model, which uses deviation coding for group, the intercept represents the overall mean of the outcome value y across the groups a and b, whereas the coefficient of group1 represents the difference between this overall mean and the mean of the outcome value y for group a. The overall mean is none other than the mean of these two means: (i) the mean of y for group a and (ii) the mean of y for group b. (overall mean - mean of group a) + (overall mean - mean of group b) = 0. (overall mean - mean of group b) = -(overall mean - mean of group a). Deviation of the slope of the group b regression line from the overall slope (via the p-value reported for pred:group1). I hope this answers your question, which was very interesting. Not the answer you're looking for? Browse other questions tagged multiple-regression categorical-data categorical-encoding contrasts or ask your own question. Possible to code contrasts comparing each level to grand mean with no reference category? Why different coding gives the same sums of square?